Here at Brandon Ford in Tampa, FL, we think buying a used car, truck or SUV is a great move for many automotive customers. And now it’s an even better idea for lovers of the Ford Focus lineup of hatchbacks and sedans because there’s been no word on when the new 2019 Ford Focus lineup is going to be released, meaning a used 2018 Ford Focus from Brandon Ford in Tampa, FL, is not only a great buy, but also the only way you’re going to get behind the wheel of one of the most powerful, efficient and fun to drive sedan and hatchback lineups around in the foreseeable future. Now, we know buying a used vehicle instead of a new vehicle can be off-putting for some people, but all of our used models here at Brandon Ford go through a thorough and intensive inspection process to ensure they’re just as reliable as the new models we offer. And that includes the used 2018 Ford Focus sedans and hatchbacks we’ve got on our Brandon Ford lot. So, come on in for a test drive today and see for yourself just how impressive our used 2018 Focus models are. Just like if you were picking out a new 2018 Ford Focus at Brandon Ford in Tampa, FL, you’ll get to choose between three engine options when picking out your used 2018 Ford Focus at Brandon Ford. Those engine options include an EcoBoost 1.0-liter inline 3-cylinder engine featuring a horsepower rating of 123, a torque rating of 125 pound-feet, and gas mileage ratings of 30 city MPG and 42 highway MPG; a 2.0-liter Ti-VCT inline 4-cylinder engine featuring a horsepower rating of 160, a torque rating of 146 pound-feet, and gas mileage ratings of 27 city MPG and 40 highway MPG; and an EcoBoost 2.0-liter inline 4-cylinder engine featuring a horsepower rating of 252, a torque rating of 270 pound-feet, and gas mileage ratings of 22 city MPG and 31 highway MPG. All used 2018 Ford Focus models provide you with 90 cubic-feet of passenger space, while used 2018 Focus sedan models feature 13.2 cubic-feet of cargo space and used 2018 Focus hatchback models feature 23.3 cubic-feet of cargo space. 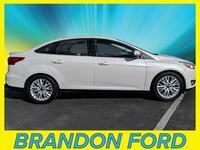 If you’d like more information on the used 2018 Ford Focus lineup at Brandon Ford in Tampa, FL, please contact our staff. Interested in a 2018 Ford Focus?